If you’re in desperate need of a deluxe holiday away from it all then look no further than the Marriott website. With their luxury accommodation services offering unique travel packages worldwide, your every wish is their command—no matter where you’re planning on escaping too. Remember to make a saving on your booking with Marriott discount codes by searching for Marriott offers on our website before you begin to book! Founded by J. Willard Marriot in 1927, the humble beginnings of this now multi-award winning conglomerate were no indicator of the kind of successes it would later come to enjoy. In the present day they operate 18 separate brands internationally including the Marriott Hotels & Resorts, the Ritz-Carlton Hotels and also the Renaissance Hotels collections just to name a few, each as carefully curated and luxuriously designed as the last, offering customer service which is second-to-none in their sector. Their brand has become synonymous with high-class accommodation and exclusivity, which is exactly what you can expect to receive when you book to stay in any one of their stunning rooms across the globe. No matter where in the world you lay your head, you can be sure that when you choose Marriott then every last detail of your dream holiday will be expertly taken care of. Make sure that you remember to redeem free Marriott vouchers when you book your stay online, and make an equally attractive saving on the room rates available too! Led by CEO Arne Sorenson. Stop by our website to pick up one of our free Marriott vouchers and then click over to the Marriott homepage to begin browsing. Get inspired by their slideshows for tips and ideas on the latest destinations and deals. If you already know exactly where you’re heading on your next trip, then use the search engine tool to find rooms by entering in your check-in and check-out dates and requirements. Locate the “Special Rates and Awards” section in the search box, where you can enter your Marriott promo code then click “Find” to run your search with the discount automatically applied and your total prices updated. Once you’ve located the hotel you would like to book for, simply click on “View Rates” and go on to select the room type depending on your preferences. You will be re-directed to a summary screen where you can review the details of your booking, then click “continue” to proceed. After entering your personal information and payment details your booking will be confirmed and details soon on the way out to you from Marriott, enjoy your stay, a restful night’s sleep, and all at a great price too! From the most fleeting of business stay-overs to the long and lazy summer holidays, whatever the reasons for your trip may be, when using Marriott discount codes to book from their expansive selection of luxury hotels and resorts you will be able to sleep easy, and enjoy a discounted room rate too! Explore their stunning range of accommodation options for yourself by visiting Marriott online today, and make sure to treat yourself to breakfast in bed when you shop online using free Marriott discount code from our website! Seek inspiration with a flick through the carefully curated destinations directory on the Marriott homepage, then go on to tailor your search. If you have a Marriott discount code, locate the “Special Rates and Awards” section in the search box, where you can enter your Marriott promo code then click “Find” to run your search with the discount automatically applied and your total prices updated. If you wish to, create a user account with Marriott to make booking next time even faster and more convenient. You can also choose to book as a guest if you prefer. Complete all your personal details and delivery options as well as your payment information, then simply wait for your booking confirmation to arrive via e-mail! Allow their website do the rest by clicking over to their homepage to get started with their online booking service. Just remember to collect free Marriott discount codes from us before you arrive there! 1. Visit the Marriott homepage and click on “Change/Cancel Reservations”, which can be found at the top of the page. 2. Enter your last name and confirmation number then click "Find". If you are registered with an account, you can review reservations by clicking "View Your Reservations" from the left-hand side of the page whilst logged in. 3. On the "Reservation Confirmation" tab, select either "Make changes to this reservation", "Cancel entire reservation" or "Reserve another room at this hotel". 4. When you select "Make changes to this reservation", you can click a corresponding link to modify "Date & Rates", "Room Preferences", "Guest Information", "Room Type", "Number of Rooms" or "Billing Information". 5. Once your changes are completed, you must click the red "Update" button to finalise the process. Be sure to keep them in your newsfeed, and share the latest updates with friends as soon as new Marriott offers become available! 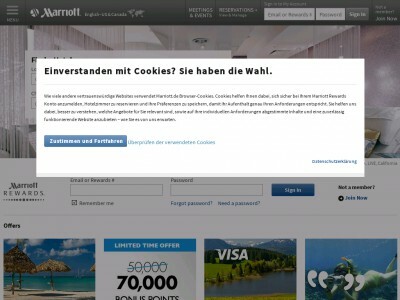 Buy now online at www.marriott.com.